Today’s topic is based on the importance of refreshing you are on page content from time to time to toggle “the fresh content factor” to get a boost in the SERPs (search engine result pages) using SEO. Chronology and relevance reside at the core of search engine optimization and frankly, a website that has remained dormant for weeks or months without an update is not that appealing to search engines. 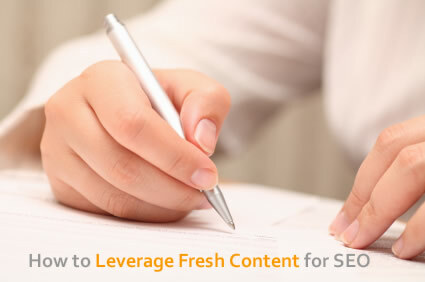 Search engines reward fresh relevant content, or content layered with existing context to reinforce relevance. On the contrary, once you reach a particular stage of on page and off page relevance for a series of keywords and terms, allowing your site to percolate ranking factors is just fine. Once you exceed the base level ranking criteria for a keyword, you can remain buoyant for extended periods. The point is, you must first cross the tipping point or your website and its rankings will be subject to volatility and receding in the index. The primary objective is, to get a website into a favorable position if you intend to decrease post frequency. Since relevance is a two-way street (based on the synergy or information and people looking for information), one metric search engines use to assess relevance is how frequently you add to modifying content. In fact, there is even an HTTP/1.1 status code to summarize if your content has changed or not, it is known as the 304 HTTP status code. The 304 status of a page translates into – not modified – and in a sea of gigaflops of information being skimmed, crawled and indexed on virtually every topic and website online, the website/page freshness factor counts when it comes to how your page is evaluated in the index. Aside from relevance, and the volume of competition on each subject in search engines, you must first mirror that relevance within your website, then receive validation from other websites in order to exceed others targeting the same keywords and rankings. I have seen this aspect of optimization countless times. If you neglect a website before reaching a particular relevance plateau, a website can flounder and remain dormant and essentially fizzle out in contention to SEO. One tactic we utilize to overcome such stagnation is to go back and edit similar pages in the site that share a topic or have an overlapping frequency of terms which can be used to strengthen the internal linking of a website. For example, if you wanted to increase your search engine positioning for Keyword A, then you (1) find all pages in your website that have context for singular and plural versions of Keyword A (2) edit those pages to link out to your NEW page (based on Keyword A) and then when those old pages get crawled and indexed you already have relevant links to reinforce and communicate topical relevance for Keyword A. Link reputation is also known as the link graph (a metric that looks at the links in and links out to each page in your website) is responsible for sculpting the way a page communicates intent and how it is valued in context for the keywords appearing in the links. 50% of the ranking factor is under your control with on-page optimization and layering through methods described above (uniting co-occurrence for a favorable concentration of context). These two attributes on page continuity and off page link reputation are some of the primary metrics search engines use to determine where to put your page in the index (relevance score) as well as the degree of trust and authority your website can gain regarding the topical context of the subject matter. The idea is, to concentrate your content as much as possible through revisions, deep links and creating fresh content based on keyword research to preserve the rankings you have, while simultaneously scaling the heights of new/relevant keywords that can benefit your website and ultimately your business model. Previous Article SEO Is Great, But What Happens Next?